“The exciting thing about these findings is that they hold out the promise that spinal-cord injuries can be cured, to an extent that restores walking," said a brain scientist at the University of Washington. Each of the three men has learned to move previously limp muscles. David Mzee broke his neck in 2010. He was a college student in Zurich at the time, an athlete who enjoyed risk and contact, and he flipped off a trampoline and onto a foam pad. “The foam pad, it didn’t do its job,” he said. 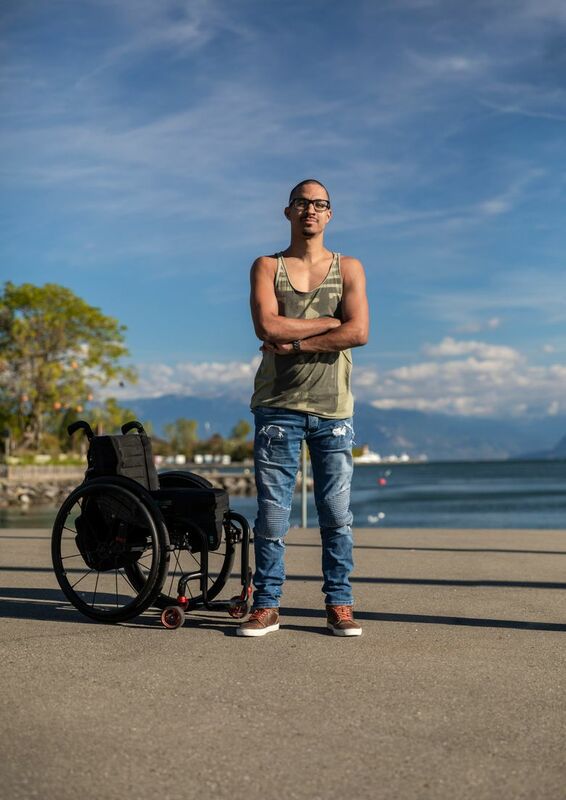 Mzee, now 33, is one of three men who lost the use of their legs years ago after severe spinal injuries, but who now are able to walk without any supports, if briefly and awkwardly, with the help of a pacemakerlike implant, scientists reported Wednesday. The breakthrough is the latest achievement in the effort to understand and treat such life-changing injuries. Several recent studies have restored motion to paralyzed or partially paralyzed patients by applying continuous electrical stimulation to the spinal cord. The new report, described in the journal Nature, is the first demonstration of so-called patterned stimulation: An implant sends bursts of targeted stimulation to the muscles that intend to move. In effect, the stimulation occurs on an as-needed basis, roughly mimicking the body’s own signaling mechanism. The treatment is still experimental, and its effectiveness for others with complete or partial paralysis is yet to be worked out. The three men had some sensation in their legs before the trial began, and they needed months of intensive training to achieve their first awkward steps. They still rely on wheelchairs; two can walk out in the community, using walkers. Each has learned to move previously limp muscles without help from the implant, an indication that the electrical stimulation prompted nerves to regrow. Chet Moritz, a brain scientist at the University of Washington, who was not involved in the study, was impressed by the results. “The exciting thing about these findings is that they hold out the promise that spinal-cord injuries can be cured, to an extent that restores walking, and that many movements persist even when stimulation is turned off,” he said. Other researchers cautioned that the study was small, and that the patients were only partially paralyzed. “We’re still a long way from people being able to access this as standard medical care,” said Dr. Kimberly Anderson, professor of physical medicine and rehabilitation at Case Western Reserve University School of Medicine in Cleveland, although she added that the approach has great potential. In recent years, researchers have used brain implants — electrode chips, placed below the skull on the motor area of the cortex — to decode neural signals and restore movement in people and nonhuman primates who have lost the use of limbs. Still other scientists are investigating nerve-growth factors, chemical compounds that are injected at the site of an injury to promote repair. The authors of the new report, who are based at the Swiss Federal Institute of Technology, in Lausanne, previously had demonstrated that rats that had lost the use of their hind legs could be trained to run again when continuous current was applied through the spinal cord to the muscles. Other research teams recently have reported that continuous stimulation could also restore some movement in human patients. But in people, continuous stimulation seems to send mixed signals to the muscles, activating some and confusing others, the authors of the new study say in a companion paper in the current issue of Nature Neuroscience. The three men in the new trial showed more rapid improvements than did most subjects in previous trials, but their injuries were also less severe. The treatment of the men began with surgery. Doctors implanted a small patch of electrodes on the surface of the spinal cord in the lower back, below where each injury had occurred. The patch was connected to a pacemaker device, which was placed in the abdomen. The implanted device, when turned on, delivered bursts of stimulation to individual muscles as they were called into use. The intention to lift a knee generated a certain pattern of nerve firing; stepping forward generated a different one. In effect, the device provided the pattern of stimulation that the body delivered before the injury occurred. Over time — with intensive physical therapy, on a treadmill with hand supports — the stimulation appeared to engage the brain’s motor cortex through nerves that were spared from injury, Courtine said. “In the animal studies, the reorganization in the brain was really massive,” Courtine said. “There were a lot of new connections from the motor cortex to brain stem.” The same would be expected in humans, he said. “It’s really hard to say what’s coming next for me,” Mzee said.